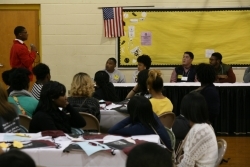 College of Justice & Safety students, faculty and alumni joined safety and criminal justice professionals to share educational and career advice and personal experiences with Louisville Central High School students on Tuesday, December 1, 2015. The professional panelists - William Swope, State Fire Marshal, KY Department of Housing, Buildings & Construction, Public Protection Cabinet; Andrea Brown, First Division Major, Louisville Metro Police Department; and EKU College of Justice & Safety professors Dr. Sandy Hunter, Emergency Medical Care and Dr. Troy Rawlins, Occupational Safety, discussed why they chose careers in justice and safety, their roles and responsibilities, the impact of their professions in making their communities safer places to live and work and the challenges and rewards of their professions. 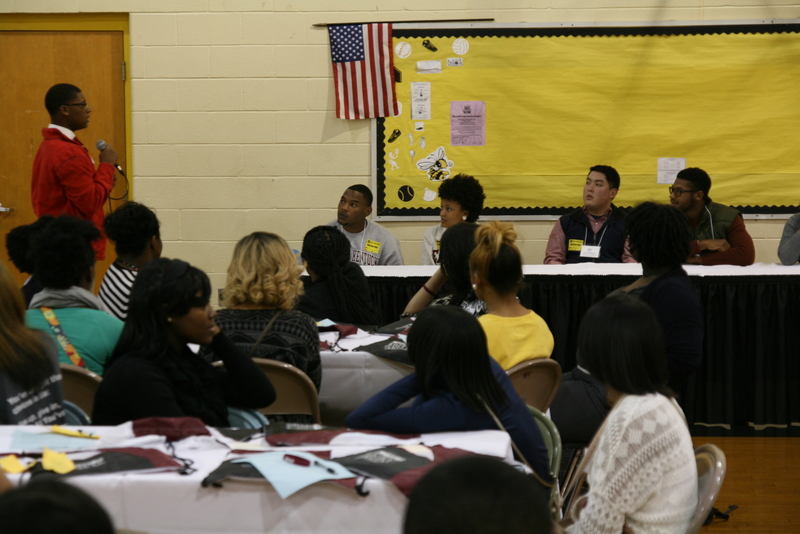 Criminal Justice majors Asia Nichols and Kevin Ross, Homeland Security major Jaysuma Webb and Emergency Medical Care graduate Alex Dougherty shared their experiences at EKU as well as career goals and suggestions on how to succeed in college. Over 60 LCHS freshmen, sophomores and juniors were also treated to a tour of the Louisville Metro Police Bomb Response Unit vehicle and a demonstration of their bomb disposal robot. The event is designed to encourage minority students to consider careers in law enforcement, criminal justice, corrections, occupational safety, fire and safety, emergency medical care and security.